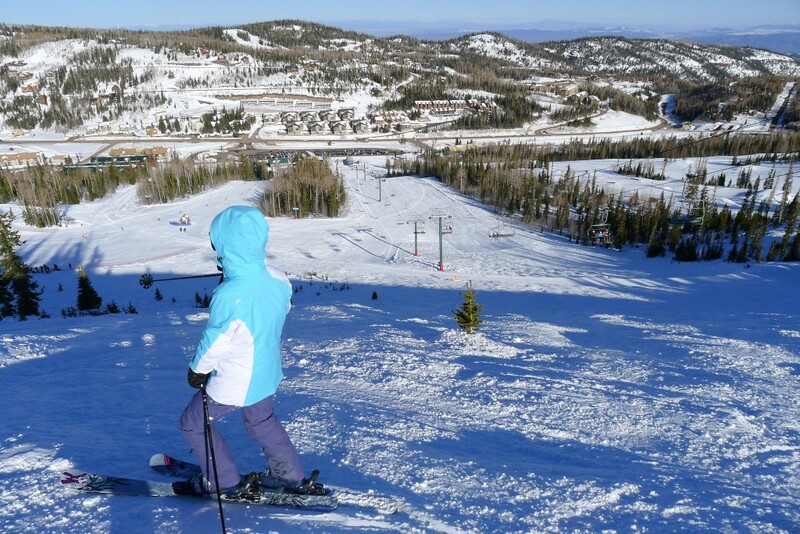 Brian Head is one of the smaller Western US resorts on our list and is located in Southwestern Utah. It is popular with skiers from Las Vegas. 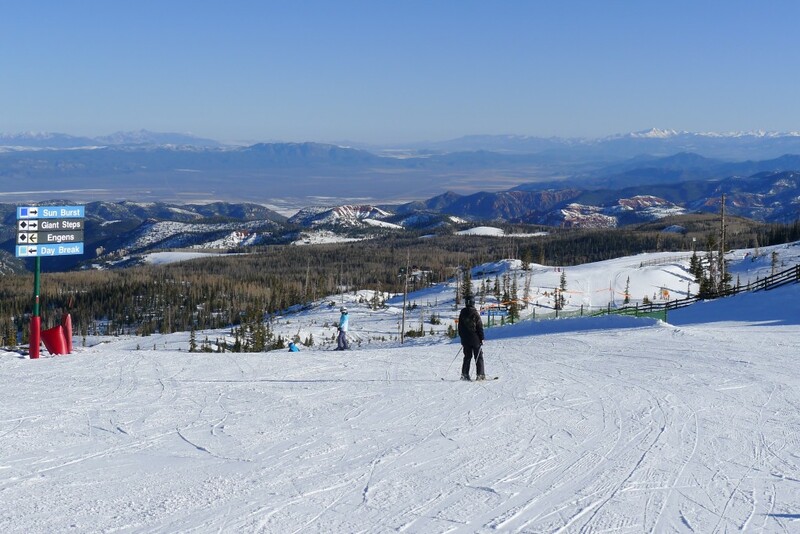 The winter of 2014/15 was brutally snow-free in the southwest US, but in early March the biggest storm of the year came through southern Utah, Arizona, Colorado, and New Mexico, so we hit the road with a plan to ski 4 of the resorts that were among the big snowfall winners. 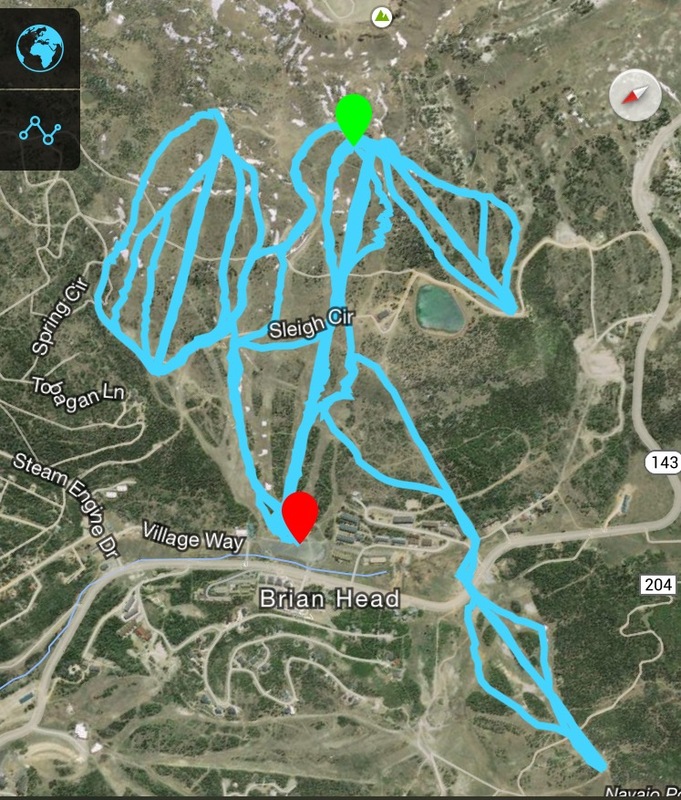 First on the menu was Brian Head, which was a conveniently located between us and our main destination Telluride. There are a surprising number of condos and houses in the village at Brian Head for a ski hill of this size, but we stayed in Cedar City which is the closest city since we were just staying one night and it was easier to book. There was a lot of snowmobile traffic in the village which seems to be a popular activity there. 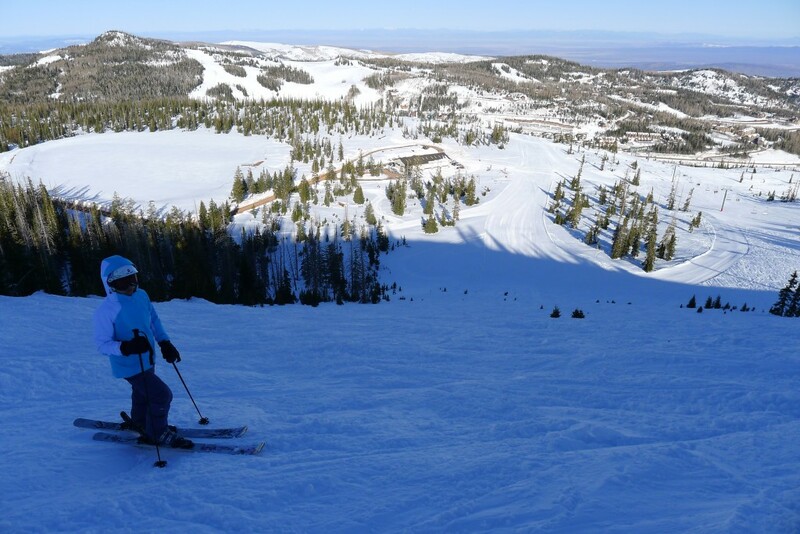 The drive up to the base area from the main highway is steep and winding, like most of the resorts in the Southwest U.S. The base elevation is 9,600ft, which is the highest in Utah. This high elevation offsets the southern latitude somewhat, keeping the snow drier and lighter than you would expect this far south. 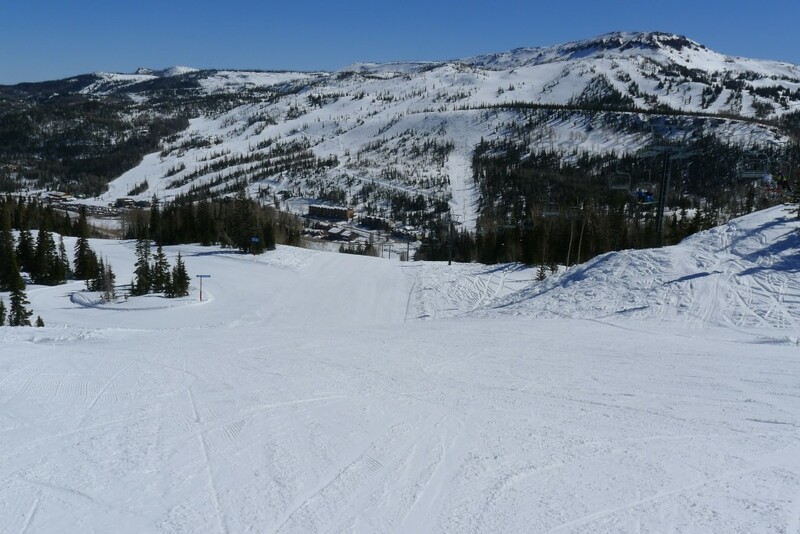 Brian Head had received 60″ of snow the week before, and we caught the very end of the winter snow before it turned to corn and slush. There is one high speed quad “Giant Steps” at the resort, with a vertical of just about 1,200 ft. 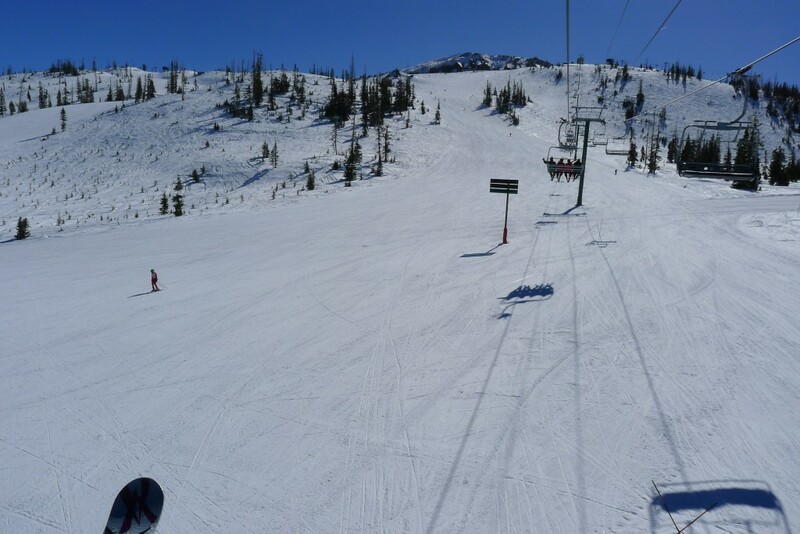 It accesses mostly low-angle intermediate terrain but there is some slightly steeper stuff on skiers left. One annoyance was the lift maze at the base which feeds in from both sides with only one ticket checker who was determined to scan EVERY ticket EVERY time. This held things up and resulted in a lot of empty chairs. Note to management: Please hire an additional ticket checker or tell the one you have that it is OK to remember faces and let them by without scanning if they have been scanned already. I’ve done this job myself (long ago!) and it’s not that hard. The most interesting ski pod was actually the Roulette chair. It is a slow triple and only serves 750 vertical, but there are some entertaining drop-offs, twists, and turns on several of the runs. After those 2 lifts, the pick’ns start to get a bit thin. There are 3 other chairs with about 550 vert each and a few runs. “The Dunes” is similar to Roulette with some entertaining drop offs and turns. 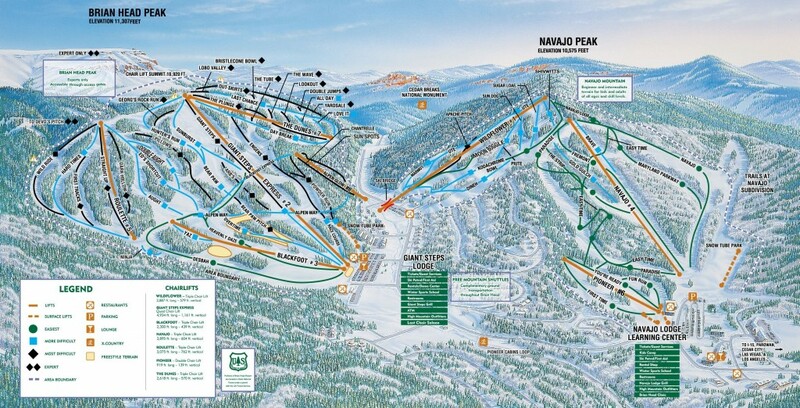 “Alpen Glow” has 2 named black runs and some skiable trees. This would be the spot on a deep powder day because it has the necessary steepness. At the bottom of Alpen Glow you can cross a ski-bridge to get to the Navajo Mountain side. This is even less steep and caters mostly to beginners out of the other base area. We took a few runs on Wildflower which was the last of the ski pods with any intermediate terrain. By now you can probably tell that we weren’t thrilled with the skiing. The main problem is that it’s just too flat. Low-intermediates will be in paradise, but there is nothing there to challenge more advanced skiers. We were bored by 11AM and only skied until 1PM. Other than the ticket checker issue mentioned above, the resort seems to be well-managed with good grooming and lift & trail maintenance. The lodges are OK and the food is standard for a place of this size. Luckily we got a tip from a local to eat at the “Korner Cafe”, which has excellent food and is about 100-yards from the main base lodge in the village. 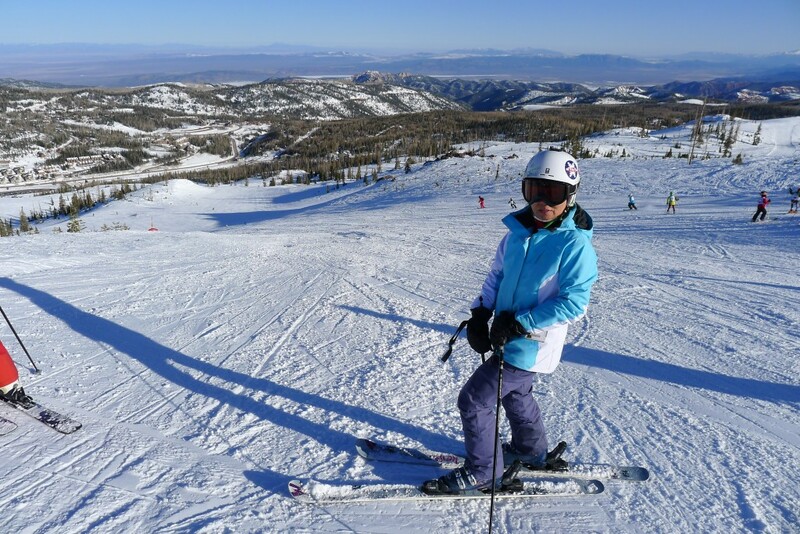 Brian Head has its charms, but there is just not enough steepness or vertical there to keep us going back for more so this is a one-and-done for us.